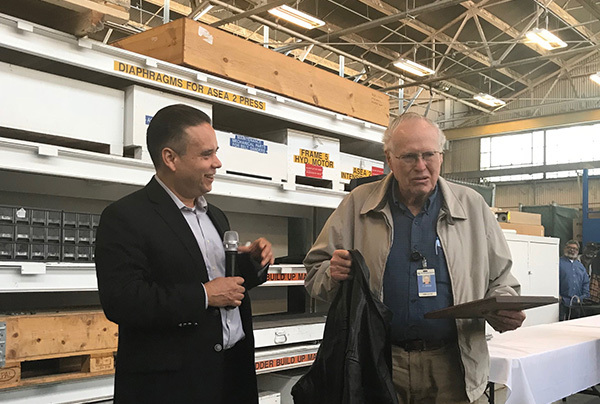 Clinton “C.L.” Williams was joined by coworkers, fellow Machinists and Western Territory General Vice President Gary Allen recently at a retirement celebration to honor his 65 years of membership and service to the IAM. C.L. initiated into Chula Vista, CA IAM Local 755 in January 1953 and is an active Life Member. Over the span of his career, he held the title of Chief Shop Steward for over 50 years and Local President for close to 50 years. He helped negotiate over 20 contracts and endured two strikes. Allen presented Williams with a plaque and a jacket to honor his service. “C.L’s retirement is well earned and well deserved. I wish him a long, happy, and healthy retirement,” said District 725 President and Directing Business Representative Larry Olinger. The celebration was well attended by more than 50 IAM members that represented over 1,700 years of service and spanning seven decades.